Cyprus – Greece – Whose Next? 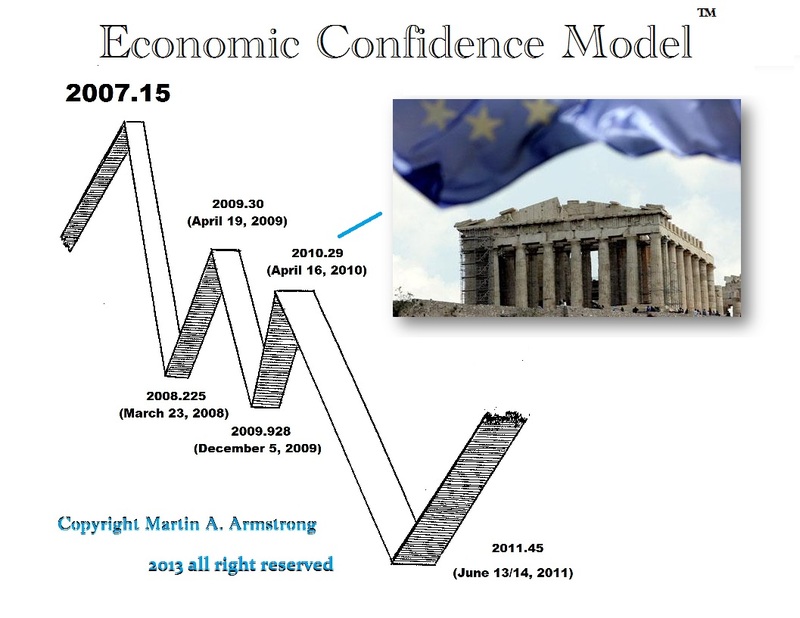 The Sovereign Debt Crisis began with Greece asking for help from the IMF to the day of pi from the peak in the ECM 2007.15. The EU then crushed Cyprus to see how they could get away with not paying people or honoring their debts. The Cyprus experiment was the start of the bail-in that is now a matter of law in just about every country. It is amazing just how stupid society really is. We pay no attention to what government does and allow them to take little by little everything we have and from future generations. The EU covertly Staged Coup against Berlusconi in Italy to remove him from politics because he wanted to exit the euro. The EU rigged the Scottish to prevent any exit from the EU. They will do the same with Britain if Cameron dares to honor his pledge. Then the EU organized a rigged court to rule that the Spanish have no Right to Vote for independence. Now, the EU simply says they will not negotiate with any democratically elected government in Greece that expects to do anything other than what they dictate. It does not take much to connect the dots here. Is nothing real anymore? There are actually no democracies left in the world – they are all Republics, which pretend representatives claimed and are elected for life. They now have the audacity to deny any right to vote against their demands – this is the real Crisis in Democracy, albeit really a Crisis in Republicanism. The Euroland countries recently tried to stop the IMF from publishing its gloomy analysis of Greece’s debt burden, which the leftist government says vindicates its call to voters to reject bailout terms. The document released in Washington on Thursday said Greece’s public finances will not be sustainable without substantial debt relief, possibly including write-offs by European partners on loans guaranteed by taxpayers. Greece will need at least 50 billion euros in additional aid over the next three years to keep itself afloat. The euro is a failed experiment. The original purpose was to prevent European wars, when in fact it is not fanning the fires of separatists. The EU Commission is trying to takeover Greece by outright denying the people any right whatsoever to be heard. This is no different from Iraq’s invasion of Kuwait, except the force of arms. The EU will isolate the Greek system and the favorite threat of the IMF is to force capitulation of all tax shelter nations that they will be cut out of the SWIFT system. That will prevent them from moving money in or out. But the Greeks have the largest merchant shipping fleet in the world. If they try to do that, they may see their own ability to trade seriously reduced. Politicians who have all gone mad plague us. With these kinds of actions coming from Brussels, one must wonder just how long it is going to take before we see a major revolution hit Europe. When this contagion hits Italy and France, it looks like checkmate for Brussels.